I'm not one of these people who is going to try to convince you that my life has improved immeasurably as a result of atheism. I have been an atheist since the age of 16. While I can think of plenty of ways my life is better now than it was back then, I can also think of plenty of ways my life is far worse than it was then. It would be foolish to think that most of the things that are better (or worse) have anything to do with atheism. 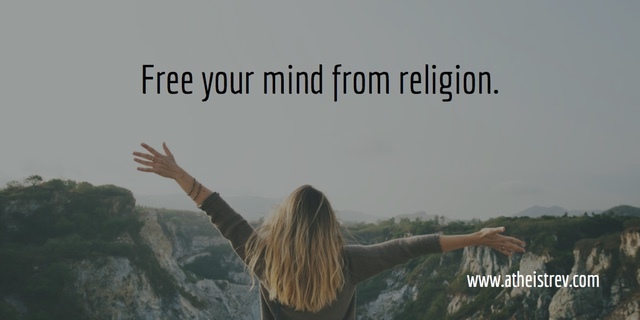 Having said that, one of the things I remember most fondly about my transition from Christian to atheist was the sense of freedom it involved. When I say "freedom" here, I'm not talking about the "anything goes" mentality some Christians want you to associate with atheism. I did not begin running wild in the streets the moment I let go of god belief. If anything, I'd say my sense of morality improved after I left Christianity because it became less about avoiding punishment due to fear and more about compassion for others. But I'm not really thinking of morality when I mention freedom in this context. What I'm thinking of is the sense of possibility that occurred to me at 16. The world seemed to open up as I stopped pretending to know things I didn't know and embraced uncertainty. It wasn't that uncertainty wasn't scary. It was scary, especially when contrast with the relative comfort and familiarity offered by religion. The flip side was an exhilarating sense of limitlessness. I didn't have all the answers, and that was okay. Nobody else did either in spite of their desire to pretend otherwise. I was now free to discover reality for myself. And atheism was going to be part of that reality because there wasn't any evidence that gods were real. I'd been thoroughly indoctrinated into the religious traditions preferred by my family. I'd never pretend to be an expert on them, but they were certainly familiar to me. Atheism was a complete unknown. I knew next to nothing about it. I just knew that I no longer believed in gods and that others like me were called atheists. I was going to have to learn everything else worth knowing about it. Even though I am still learning about atheism, I've realized that it is relatively trivial in the big picture. There are many other far more important things about me, others, and the world around us worth learning. And this sort of learning, growth, exploration, or whatever else one wants to call it is much easier for a mind freed from religion.